The core secondary course sequence is shown above. Different high school course-taking options are shown on our High School Mathematics Pathways page. Our SFUSD Math Position Paper, which became the Course Sequence Recommendation to the School Board and was adopted on February 25, 2014, outlines the course sequence and provides evidence to support it. How is CCSS Algebra 1 more rigorous? 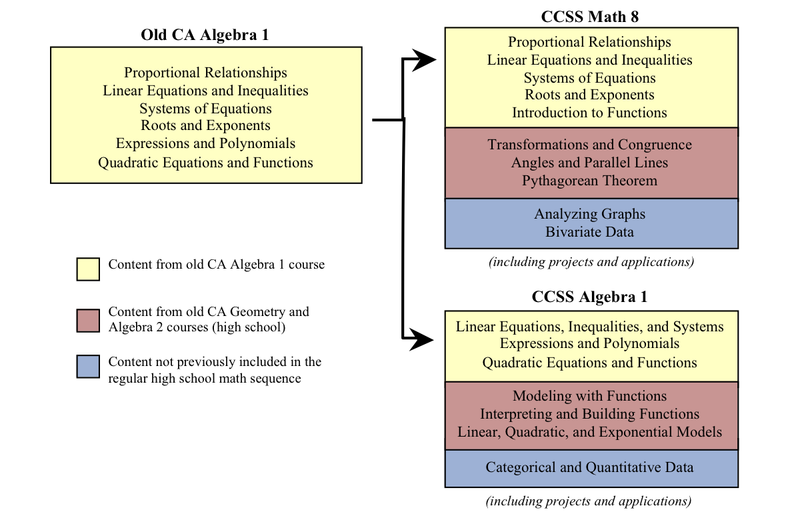 ​The standards that defined an Algebra 1 course under the old California standards are now divided between the CCSS Math 8 course and the CCSS Algebra 1 course, as shown below. CCSS Math 8 and CCSS Algebra 1 courses also include content from more advanced high school courses and concepts not previously taught in high school math, especially statistics. How one city got math right: Pathways that work In this editorial in the Hechinger Report, Jo Boaler, Alan Schoenfeld, Phil Daro, Harold Asturias, Patrick Callahan, and David Foster detail the changes made in SFUSD and the results seen so far. We are excited to see evidence that high school students are taking more math and science classes, as shown in this course taking data for juniors and seniors (updated May 2018). Historic shifts in Math show promise––Students significantly more likely to pass Algebra the first time. Former Superintendent Carranza's comments to the School Board at a March 10, 2015 meeting address concerns about the Course Sequence. The African American Parent Advisory Council (AAPAC) shared a letter supporting the district’s new math course sequence. Read about how the Common Core State Standards in Mathematics led to the new course sequence in mathematics for middle school and high school. Read in Spanish or Chinese. The SFUSD math course sequence ensures a solid middle-grades foundation that not only supports all students to successfully meet the UC “c” requirement, but also prepares them for college mathematics. Having one core sequence provides focus and coherence as schools and teachers implement the CCSS-M and supports equity by creating a path for all students to experience rigorous mathematics. Implementation of the CCSS-M requires each student to have a focused, coherent, and rigorous learning experience in mathematics that makes sense to students as they move from course to course, and that ensures students are college-ready by the end of high school. . Focusing deeply on fewer concepts allows students to gain strong foundational conceptual understanding, and developing coherence across grades allows students to build upon deep conceptual understanding from earlier years so that each standard is not a new event, but an extension of previous learning. As we move into a time of dramatically increased rigor and alignment in the K–12 math sequence, we need to make the necessary adjustments to ensure every student has access to an aligned course sequence in which high-quality teaching and learning are the norm. Historically, rigor meant doing higher grade-level material at earlier grades, and equity meant providing all students equal access. The CCSS-M require a shift to seeing rigor as depth of understanding and the ability to communicate this understanding, and to seeing equity as providing all students equal success.